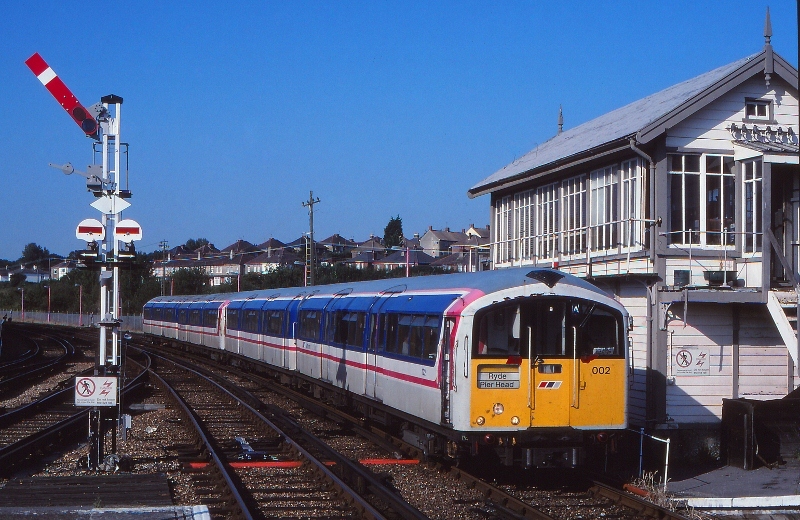 Martyn Hilbert's Railway Photography - Isle of Wight - 483002 at Ryde St Johns Road. 483002 at Ryde St Johns Road. A scene from the last summer of the 20th Century. 483002 approaches Ryde St Johns Road with a servce from Shanklin to Ryde Pier Head on a glorious summer morning in July 1999. The Network South East Livery on 483002 is starting to look worn, and there are traces of the former London Transport Red starting to appear on the front end. The unit is passing the former SECR signalbox moved by the Southern Railway from Waterloo Junction in 1928, as part of the SR Isle of Wight upgrade programme.